Dental X-rays are primarily used for diagnostic medical imaging and crystallography. The image formed by x-rays on a sensitive film is referred to as a radiograph. X-rays can identify teethy structures, X-rays have been developed for their use in medical imaging. Radiology is a specialized field of medicine. Radiographers employ radiography and other techniques for diagnostic imaging. Indeed, this is probably the most common use of X-ray technology. are pictures of the teeth, bones, and surrounding soft tissues to screen for and help identify problems with the teeth, mouth, and jaw. X-ray pictures can show cavities, hidden dental structures (such as wisdom teeth), and bone loss that cannot be seen during a visual examination. Dental X-rays may also be done as follow-up after dental treatments. The following types of dental X-rays are commonly used. Bitewing X-rays use the least amount of radiation and show the upper and lower back teeth in a single view. They are used to detect decay between the teeth and to show how well the upper and lower teeth line up. They also show bone loss that usually indicates the presence of severe gum disease or a dental infection. Periapical X-rays show the entire tooth, from the exposed crown to the end of the root and the bones that support the tooth. These X-rays are used to detect dental problems below the gum line or in the jaw, including the presence of impacted teeth. Occlusal X-rays show the roof or floor of the mouth and are used to detect the presence of extra teeth, teeth that have not yet broken through the gums, jaw fractures, a cleft in the roof of the mouth (cleft palate), cysts, abscesses, or growths (such as a tumor). Occlusal X-rays may also be used to locate foreign objects. 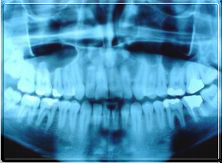 Panoramic X-rays provide a broad view of the jaws, teeth, sinuses, nasal area, and temporomandibular (jaw) joints. These X-rays do not show the detail needed to detect cavities. These X-rays reveal problems such as impacted teeth, bone abnormalities, cysts, solid growths (tumors), infections, and fractures. A full-mouth series of periapical X-rays, which may consist of 14 to 21 X-rays, are most often done during the first visit to the dentist. Bitewings are used during checkups to help the dentist diagnose tooth decay. Panoramic X-rays may be used periodically to screen for dental conditions. Like other aspects of your dental care, dental X-rays are scheduled on an individual basis and may vary with your age, risk for disease, and signs of disease. Detect problems in the mouth such as tooth decay, damage to the bones supporting the teeth, and dental injuries (such as broken tooth roots). Dental X-rays are often done to detect these problems early, before any symptoms are experienced. Detect teeth that are abnormally placed or don't break through the gums properly. Teeth that are too crowded to break through the gums are called impacted. Detect cysts, solid growths (tumors), or abscesses caused by certain dental problems. Evaluate the presence and location of permanent teeth growing in the jaw in children who still have their primary (or baby) teeth. Plan treatment of teeth that are not properly aligned (orthodontic treatment). Without X-rays, dentists would miss the early stages of decay between teeth. Before the X-ray test, tell your doctor if you are or might be pregnant. If you are pregnant, routine dental X-rays may be postponed to reduce radiation exposure to your developing baby (fetus). The risk depends on your baby's stage of development. The chance of harm to your baby is usually very small, and if dental X-rays are absolutely necessary, a lead apron will be placed over your abdomen to shield your baby from exposure to the X-rays. You can take precautions to reduce your risk of radiation exposure from X-rays. No other special preparations are needed before having a dental X-ray. Dental X-rays are taken in the dentist's office. The X-ray pictures are interpreted by your dentist. A dental technician will cover you with a heavy lead apron as you sit upright in a chair. This apron shields your body from X-rays. Modern lead aprons have a collar (called a thyroid shield) to protect the thyroid from radiation. Everyone else in the room will also wear a protective apron or stay behind a protective shield. The dental technician will have you bite down on a small piece of cardboard or plastic. The cardboard or plastic contains X-ray film and helps align your teeth while the X-ray is being taken. When your teeth are aligned properly, the technician will take the X-ray picture. The process may be repeated several times to get pictures of all your teeth. You may want to rinse your mouth before and after the procedure to make the process easier. X-rays take only a few minutes and are not painful. Some people may gag on the plastic or cardboard that holds the X-ray film. People often find it easier to relax if they focus on something else (such as an object on the wall) and take slow, deep breaths through their nose during the process. There is always a slight risk of damage to cells or tissue from being exposed to any radiation, including the low levels of radiation used for this test. However, the risk of damage from the X-rays is usually very low compared with the potential benefits of the test. There are precautions you can take to reduce your risk of radiation exposure from X-rays. Pregnant women may not want to have routine dental X-rays taken until after they give birth. Although there is no proven risk to the developing baby (fetus) from having a routine dental X-ray, delaying the X-ray for a few months will not usually result in further harm to teeth. There are times when the severity of the dental problem requires an X-ray to deal with an urgent concern. Dental X-rays are pictures of the teeth, bones, and surrounding soft tissues to screen for and help identify problems with the teeth, mouth, and jaw. Most dental X-rays can be read immediately, so results are available a few minutes after the test. Braces, retainers, dentures, bridges, and certain body piercings (ear, tongue, lip, cheek, or nose), which may stop some of the X-rays from passing through the tooth and make it difficult to read the X-ray film. Modern X-ray equipment is safe and uses very little radiation, but any unneeded X-rays should be avoided. Individual states often have strict regulations and inspection procedures governing the safe use of X-rays and X-ray equipment. Oral health professionals are taught to take high-quality X-rays while exposing you to a minimal amount of radiation. If you are going to a new dentist, have your previous dentist send copies of your recent dental X-rays to your new dentist. Doing this may help you avoid having unnecessary X-rays. There may be a slight fee to cover the cost of duplicating the X-rays. The following U.S. Food and Drug Administration (FDA) dental X-ray guidelines are for people who have no tooth decay and are not at high risk of getting cavities. Adults should have bitewing X-rays every 2 to 3 years. Adolescents should have bitewing X-rays every 1½ to 3 years. Children should have bitewing X-rays every 1 to 2 years. The following FDA guidelines are for people who have tooth decay or are at high risk of getting cavities. Adults should have bitewing X-rays every 1 to 1½ years. Adolescents should have bitewing X-rays every 6 to 12 months until no tooth decay is evident. Children should have bitewing X-rays every 6 months until no tooth decay is evident. In addition, many dentists believe that all adults should receive a screening panoramic X-ray every 2 to 5 years. Some dentists are using a new technique called digital radiography. This technique positions an electronic sensor (instead of X-ray film) at the area to be examined. An electronic image is then taken and stored in a computer. This image can be viewed almost immediately on a computer screen. Less radiation is needed to produce an image with digital radiography than with standard dental X-rays.